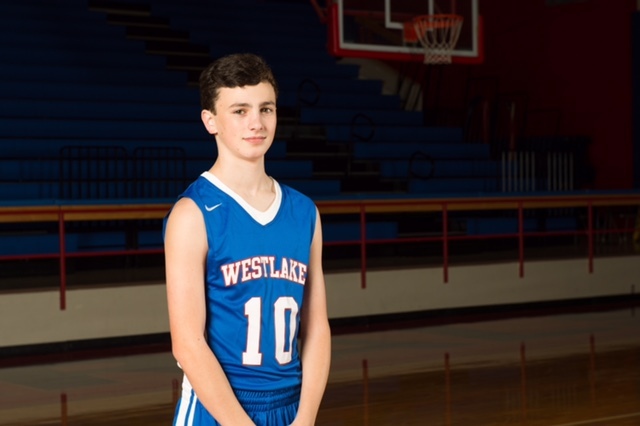 I’m a freshman at Westlake High School in Austin, TX. I was diagnosed with cystic fibrosis at birth. I live a pretty normal life outside of doing therapy twice a day and taking lots of pills. How did you learn about Team Boomer? I learned about Team Boomer from my dad when he mentioned notable people with the disease. He told me Boomer Esiasons son Gunnar has cystic fibrosis. I’ve read his blog and about Team Boomer. Making the basketball team motivates me the most. I love the sport and I want to keep playing so I train and the exercise that I get from it keeps me healthy. What is your favorite memory from Hoops 4 a Cure? My favorite memory from Hoops 4 a Cure is raising $12,000 for the Cystic Fibrosis Foundation last year. It showed how successful we were and that we need to keep hosting the event. This year the 4th annual Hoops 4 a Cure will be May 13th at the Westlake Athletic Community Center. My goal is to raise $15,000 to help find a cure. What are your favorite ways to train and exercise? My favorite way to train and exercise is playing basketball. Whether it’s practice for school or tournament basketball or even training outside of a team I love getting exercise through the sport. My trainer Jordan Kpaka is a role model of mine. I see how hard he works and where it’s taken him and it motivates me to do the same.